Older than I think I am. 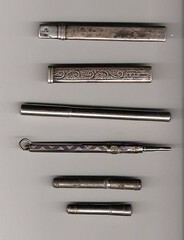 This is the most unusual..it appears to be silver and is a very flat pencil, the cover beomes the holder.A very elegant object. It took us a while to work out that it was a pencil! 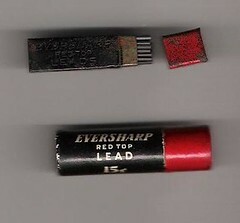 A small tin box of leads and a cardboard tube of them too. Todays find on Crewe Market. 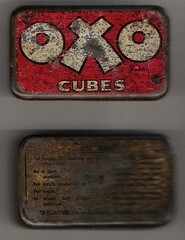 A metal tin that contained all these pencils and lead tins. I found this packet in the Salvation Army shop a few weeks ago (they havn't been any boot fairs recently). In paid 20 pence for them. 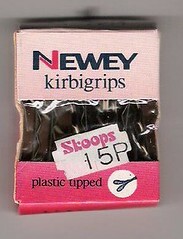 Originally I could have bought them at Skoops for 15 pence. 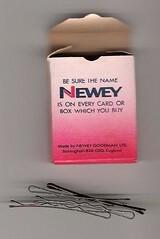 IS ON EVERY CARD OR BOX WHICH YOU BUY. A free gift from BETTERWEAR,Romford,Essex. 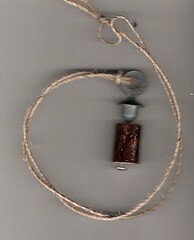 Pass thread through loop of threader. 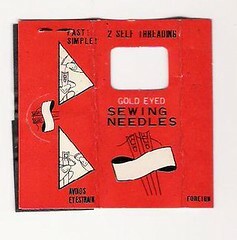 With thin piece of wire, for needle threading. The packet only contain 2 of these wonderous needles. Beautiful delicate objects...they don't self thread..just do not require threading...a subtle difference I feel. You pull the cotton down and they allow cotton in but not out again.EH? 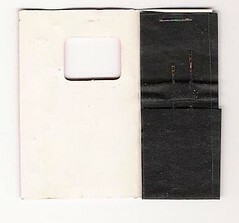 A very neat slim pocket sewing kit for those lost button emergencies. Neatly holds pins, safety pins,black and white cotton,needles,a tiny pair of scissors and 2 buttons (one missing pressumed used). A strange set of slightly rusting pens I found on the boot sale recently. They seem to be just lengths of plastic stick with simple nibs pushed on the end. This isn't metal..but it looks like it should be.PLASTIC MODEL KIT. Consigliato per bambibi da 3. Recomended for boys from 3 up. Conseille pour les enfants a partir de 3 ans. Empfohlen fur kinder ab 3 jahren. Se aconseja para ninos a partir de los 3 anos. 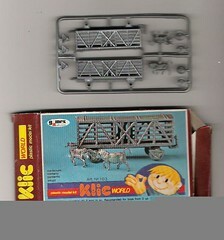 The first collection of MINI-MODELS in the world that can be assembled very easily, without scissors and without glue. Many intersting ideas, to stimulate the creativity of children. The great novelty of the year. Not sure what year that must have been!! As a hot drink in cold weather. ????? makes milk more palatable and more digestible. 'Oxo' and milk is an excellent nerve and body food. Is and appetiser mixed with butter and spreaad on biscuits. 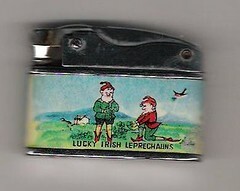 THIS IS A COPY OF WHAT I MANAGED TO READ FROM THE BACK OF THE TIN. A piece of metal I found a while ago in the street. I think it might be off some kind of lever Arch file. I now have 3 lighters which means to my mom that I have a collection. 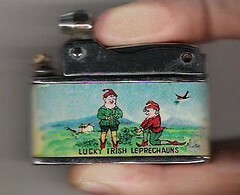 I can clearly remember as a very small child being given an old lighter and a screw driver to play with...I loved fetching it apart and putting it back together. I was never happier then when I was in my dads Garage sorting through the boxes of rusty things. (not so keen on the spidfers though). A metal screw with a handle attached to a piece of tree. It used to squeak when you twisted them together, but for some reason I seem to have worn it out!. Stamped on the top it says..